Confirmation is a public rite of the Christian Church that is preceded by a period of instruction designed to help baptized Christians identify with the life and mission of the Christian community. Having been instructed in the Christian faith prior to admission to the Lord's Supper (1 Corinthians 11:28), the rite of Confirmation provides an opportunity for the individual Christian, relying on God's promise given in Holy Baptism, to make a personal public confession of the faith and a lifelong pledge of fidelity to Christ (Matthew 10:32-33; Romans 10:9). 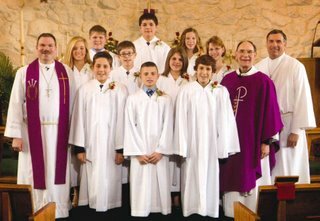 All Trinity children in the eighth grade who have been baptized and who have completed the requirements established by the congregation. Seventh and Eighth grade students are required to attend a minimum of ten Sunday School and/or Youth Group Events, they must attend confirmation instruction, and they must complete 18 Worship Reflections. All seventh grade students also receive acolyte training. Trinity School: Four times per week during school as part of the school curriculum. Public School: Once per week on Wednesdays from 4:45 to 5:45pm in the Church Library (7th & 8th grades) and Church Fellowship Hall (6th grade). Confirmation for 8th Graders is held the first Sunday in May at 1:00pm. Trinity Lutheran Church takes religious education seriously. Founded in 1865, Trinity began plans to educate people in the basics of the Christian faith as found in the Holy Bible. In 1883, Trinity established a Christian Day School which continues to this day. According to our church Constitution, parents are encouraged to participate in every opportunity for Christian education. We recognize that this is not always possible. To make certain that all of our children have received the best possible foundation for their lifelong journey in the Christian faith, our congregation has agreed upon certain basic requirements that must be me prior to being confirmed. This sermon has been undertaken for the instruction of children and uneducated people. Hence from ancient times it has been called in Greek, a "catechism" - that is, instruction for children. Its contents represent the minimum knowledge required of a Christian. Whoever does not possess it should not be reckoned among Christians nor admitted to a sacrament, just as a craftsman who does not know the rules and practices of his craft is rejected and considered incompetent. For this reason young people should be thoroughtly instructed in the various parts of the Catechism or children's sermons and diligently drilled in their practice. Therefore, it is the duty of every head of a household to examine his children at least once a week and ascertain what they have learned of it, and if they do not know it, to keep them faithfully at it. I well remember the time when there were old people who were so ignorant that they knew nothing of these things - indeed even now we find them daily - yet they come to Baptism and the Sacrament of the Altar and exercise all the rights of Christians, although those who come to the sacrament ought to know more and have a fuller understanding of all Christian doctrine than children and beginners at school.